RESEARCH | Materials scientists at UD are developing sensors they hope will allow real-time detection of water and air pollutants in an inexpensive and environmentally friendly manner. 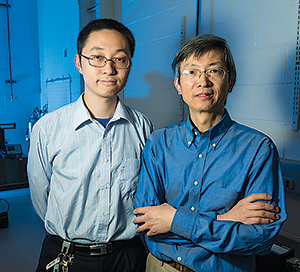 Juejun Hu and Chaoying Ni are creating small, highly sensitive devices that will detect organic, inorganic and biological molecular species at low levels in the environment. “We’re making nanostructures to detect chemical molecules in a very sensitive manner,” says Hu, an assistant professor of materials science and engineering who is the lead researcher on the project. With further research and development, he says, the devices could be integrated into portable, battery-powered sensor packages, replacing more traditional molecular detectors, which require bulky and expensive equipment. Deployed in a network in the field, an array of the small sensors could detect contamination in air, water and soil in real time and relay that information wirelessly to a computer. A major obstacle preventing small sensors from becoming practical replacements for bulky machines has been that the new technology is still less sensitive and specific in its detection than the instruments currently in use. The UD project aims to create sensors that overcome these obstacles. The researchers use a focused ion beam to punch holes into a thin strip of chalcogenide glass (ChG) a few micrometers thick, or about one-tenth the width of a hair. When light passes through the strip, molecules in the environment selectively absorb one or a few particular colors of the light. The unique optical absorption signals can then be used to identify the presence and concentration of the molecules of interest. Although the project is still in its early stages, Hu is already looking ahead to the practical benefits the devices could have for the environment. 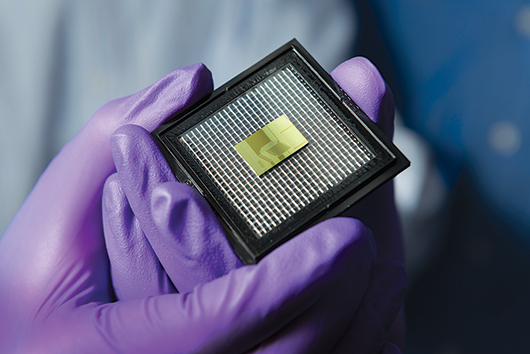 The National Science Foundation's Delaware Experimental Program to Stimulate Competitive Research provided seed money to develop the sensor-on-a-chip pollution detector. The federal program helps states develop research.